Apple Airpods Too Good or What Not? I've been longing to have one of them. And finally, after 3 years (yeah way too long ) I decided to buy a pair of it as I find the review seems to be good as legit. Its been 3 years yet the price still the same. Just a pair of Bluetooth headphones with a staggering price of $160. Along with its hefty price tag, For some, It's a symbol of Luxury brand itself - Apple. And second, A giant technology company. What about other cheaper brands? A lot of $20 to $60 wireless earphones exist, but they are not particularly high quality. And the sound quality and user experience might not be as good. And no doubt that it's extensively integrated with the Apple Ecosystem and deliver great performance. For Me, There is no way out to shift from another ecosystem. I'm totally locked out to Apple. From iCloud, Airdrop, iMessage, Facetime (As most of my colleagues, friends and family members uses it ) Moreover, I'm not into the luxury thing, however, I find Apple seems to provide a unique experience to the user. And, Another diminutive beast was added to my Apple Ecosystem. Without further ado, Here's my quick unboxing review of the Apple Airpods. Apple Airpods was introduced on September 7, 2016. The case of the Apple Airpods has a resemblance to a dental floss case. Pretty neat and has a minimalistic design. Hidden inside is the airpod itself. It comes with a booklet explaining how to pair with them. Some warranty information as well. I bought an accessory - Jelly case to protect the case from scratches. 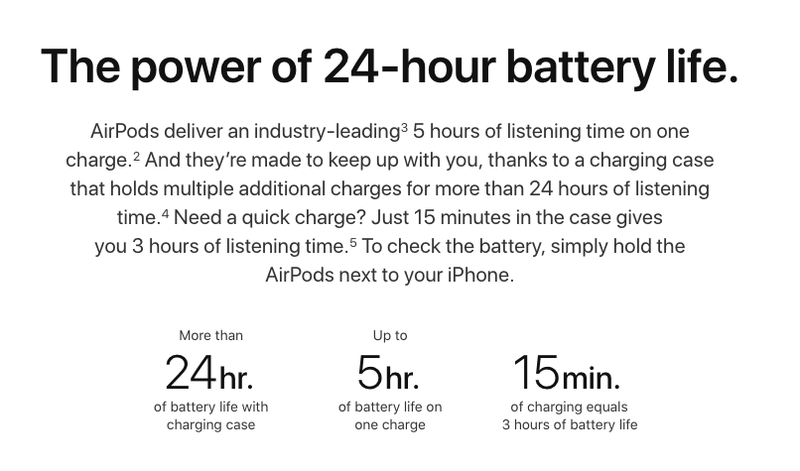 As per Apple, It promises that the battery life of the charging case will last up to 24 hours, up to 5 hours of battery life on one charge and 15 minutes of charging equals to 3 hours of battery life. And it seems that Apple is correct (*of course). 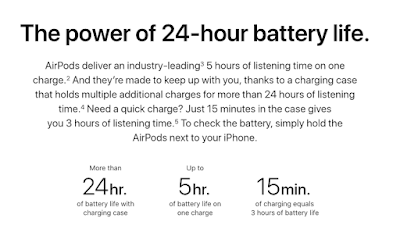 As I use the airpods for the very first time, the charging case is 80 percent and the earphones have both 80 percent battery life. I used them for listening to music , watching youtube on my iPad, Netflix on my MacBook, and podcast for two days without charging on the wall outlet. And I can see that it delivers a promising result and a unique experience. It is so easy. Make sure that your iPhone's Bluetooth is enabled. Flip the case of the Airpod near to your device. Just tap connect, wait for a second and that's it. Battery indicators from the earphones and the case will show up. Note: I will update this content and will create a follow-up review after 3 weeks. Thanks for reading and don't forget to share and subscribe to my RSS feed.